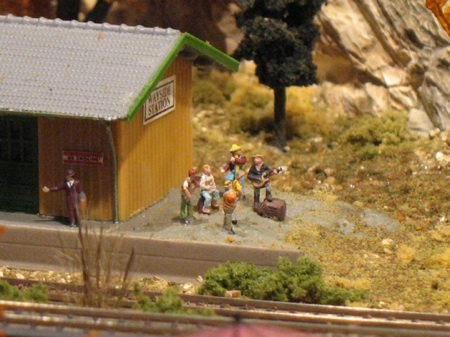 Displaying model train photos is probably the most exciting section of this entire website. This is the place where we can show off and brag about the great work that we’ve done and show other model railroaders what we’ve been up to. Also, we can be inspired by what others have done and strive to make our own layouts even better as a result. If you would rather not use the form at the bottom of the page, you can just send in your photos as an email attachment to gjwarth@mac.com. Make sure you include your name, email address, and general location and tell us a few words or a story about the photos. The photos will then show up either on this page or as a link from this page. I will add more gallery pages as needed. If you would like to show off your layout (or even a small section of it), on the Showcase page, click here. To see the showcase layouts that have been entered so far, click here. There are lots of photos of model railroads on these Showcase pages. Also, if you like rail fanning and have some photos that you have taken of prototypical trains or railroad equipment, please feel free to send those in as well. If you would like to review a few tips and techniques on how to take great model railroad photos, check out the photography tutorial page. Also, you may want to see the page on O. Winston Link, one of the the great masters of railroad photography from the steam era. Installing a video camera on your train is another fun way of enhancing your model railroading experience. Open the page on train cams to find more information on this. Pokie Roads - Blue Ridge and Southern RR from Greg Warth on Vimeo. KCS&P Fast Freight RR - built by Ted DiMone in O Gauge. Here are some great prototypical and model railroad photos from the www.model-railroad-infoguy.com website that you might enjoy. If you decide to use one of the forms below, please write in something about your photos or your layout in the space provided. Make a story about them if you wish. Then click on the button at the bottom that says, "Click here to get the address to upload your photos", or "Post your photos". You will then receive the actual email address to upload your photos or videos. I realize this is an extra step, but it helps to cut down on spam. If you don't see your photos show up in either the Showcase page or the Gallery page within a week, that means I didn't get them. In that case, just use my direct email address: gjwarth@mac.com. From "Train Photos" to "Homepage"